The Sauvignon grape varietal grows in Alto Adige since more than a century. 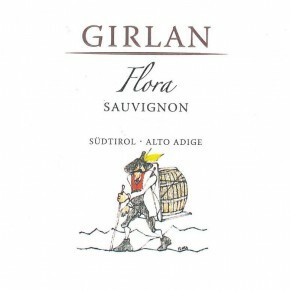 For this extraordinary wine Girlan chooses the best Sauvignon grapes from the hillside vineyards of Cornaiano, Monticolo and Appiano Monte (500 meters above sea level) and the different combination of soils gives this wine unique character. Sauvignon selezione Flora offers an intense bouquet of nettle and elderflower and a fresh lively flavor are typical qualities of this variety. The mineral nature and fresh acidity balance out in the aromas. A wine that adapts well to accompany fish, shellfish, asparagus and white meat dishes. Different combinations of soil, from clay to lime and gravel. The grapes are picked by hand and placed in small containers to prevent excess pressure on the grapes. Gentle whole cluster pressing and clarification of the must by natural sedimentation. Fermentation in stainless steel tanks at a controlled temperature. Aging on the lees for 8 months in stainless steel tanks without malolatic fermentation.